Toyota has opened pre-orders for its fifth-generation Rav4, which brings a hybrid-only line-up in line with the brand’s plans to axe diesel across its line-up. 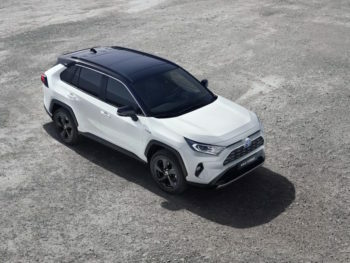 Priced from £29,635 and due in showrooms from February, the latest iteration of the SUV is built on the same Toyota New Global Architecture (TNGA) platform used on models including the Prius and the new Corolla. This brings increased passenger and load space on a longer wheelbase but with a lower centre of gravity and substantial increase in body rigidity. All models come with Toyota’s latest 2.5-litre hybrid powertrain married up with a CVT and offering a choice of front-wheel drive or Toyota’s latest electric-powered all-wheel drive, which offers a new Trail function. In front-wheel drive models, maximum output is 215bhp, with CO2 emissions from 102g/km, while in the all-wheel drive powertrain, power is 219bhp with emissions from 103g/km. Four trim levels are on offer – Icon, Design, Dynamic and Excel – with four-wheel drive available on all bar the entry-level Icon. Standard features on the Icon include 17-inch alloys, rear parking sensors, rain-sensing wipers and dark-sensing headlights, auto-dimming rear-view mirror, push-button start, electronic parking brake and power-adjustable heated door mirrors with auto-folding function. Also included is the Toyota Touch 2 infotainment system with eight-inch multimedia touchscreen, a seven-inch colour TFT driver’s multi-information display and DAB. All new RAV4 models are equipped with the second generation of the Toyota Safety Sense package of driver assistancde technologies, which brings updates to the Pre-Collision System and Adaptive Cruise Control. Deliveries of front-wheel drive models start from 1 April; all-wheel drive versions will follow from May 2019.